Toyota City, Japan, December 13, 2017―Toyota Motor Corporation (Toyota) and Panasonic Corporation (Panasonic) announce today an agreement to begin studying the feasibility of a joint automotive prismatic battery business. This agreement between the two companies aims to help find solutions to pressing societal issues such as global warming, air pollution, the depletion of natural resources and energy security. Furthermore, this agreement is intended to address growing demand and expectations for electrified vehicles. In order to realize these objectives, Toyota and Panasonic target further advancements in automotive batteries, which are crucial technologies in electrified vehicles. 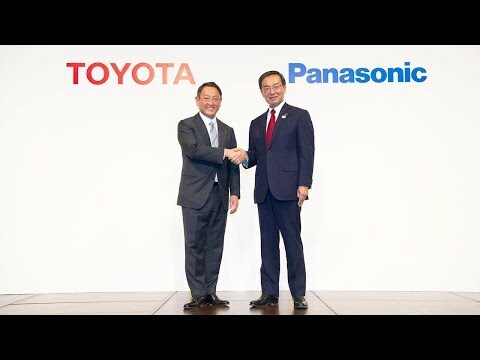 Since Toyota and Panasonic began their business relationship in 1953, the two companies have been challenging each other with the goal of mutual improvement, particularly in honing their manufacturing capabilities (monozukuri). With the business environment undergoing drastic change, both companies have realized the importance of collaborating with trusted partners and looking past conventional boundaries to contribute to the world through monozukuri and creating new value. Through activities such as launching the Prius, the world's first mass production hybrid vehicle (HV), in 1997, and the Mirai fuel cell vehicle (FCV) in 2014, Toyota has a record of taking on difficult challenges in its effort to realize a sustainable mobility society. Leveraging the know-how and experience accumulated through the continuous refinement and commercialization of its electrification technologies, Toyota is working on the development of a full range of environmentally friendly vehicles including HVs, PHVs (plug-in hybrid vehicles), FCVs, and EVs (electric vehicles) that fit the needs of customers' lifestyles worldwide. Panasonic has positioned automotive lithium-ion batteries as one of its key businesses, and its automotive batteries are used by many automakers worldwide. Panasonic's technological capabilities which achieve various requirements for such batteries are well regarded in the market. The company is making efforts to further enhance the safety and capacity of its automotive prismatic batteries, making use of its accumulated technological knowledge in the battery business. Toyota and Panasonic recognize the importance that further advancements in battery performance, price and safety, as well as a stable supply capacity, will have on encouraging further popularization of electrified vehicles. Both companies will consider details of the collaboration with the aim of achieving the best automotive prismatic battery in the industry and, ultimately, contributing to the popularization of Toyota's and other automakers' electrified vehicles. Hello everyone. I am Akio Toyoda. I sincerely thank you all for attending this joint press conference, despite your busy schedules and such short notice. Today, Toyota Motor Corporation and Panasonic Corporation have concluded an agreement to study the feasibility of collaboration on automotive prismatic batteries. To solve issues currently confronting us worldwide, such as global warming, air pollution, the depletion of natural resources and energy security, it will be necessary to further the popularization of electrified vehicles. In accomplishing such, when it comes to automotive batteries, which represent a key component of electrified vehicles, it can be said that further evolution, in terms of performance, price, and safety, and the securing of stable supply capacity, are pressing issues. Recognizing this, both companies intend to broadly study concrete areas of collaboration from automotive prismatic lithium-ion batteries to next-generation batteries, such as solid-state, including procurement of the resources for such, all the way to reuse and recycling. Now, I would like to talk a little about my thoughts behind the agreement being announced today. Toyota has long been involved in battery development, going all the way back to 1925. Sakichi Toyoda, founder of the Toyota Group, offered a prize of 1 million yen to encourage the development of a storage battery. To give you an idea of the enormity of that amount of money at the time, the capital funds of Toyota Automatic Loom Works, now Toyota Industries Corporation, which was established the following year in 1926, was also 1 million yen. The envisioned storage battery was one that would have an output of 100 horsepower and could operate for 36 hours, while being no heavier than 225 kilograms, no larger than 280 liters in volume and having potential for industrial production. Known as the "Sakichi Battery", to this day there has yet to be a battery developed capable of such performance. Perhaps Sakichi had already foreseen the arrival of the age of electrification that we are seeing today. More than 90 years later in 2013, I had the occasion to welcome a particular individual to the Sakichi Toyoda Memorial House in Shizuoka Prefecture's Kosai City. That person was Panasonic President Kazuhiro Tsuga, who is here next to me. A year after Mr. Tsuga became president, he visited the Sakichi Toyoda Memorial House, which can be said to be the origin of Toyota. As I showed him around while talking about various things, the expressions on his face, his body language and all the things he said made me keenly aware of his feelings toward the founding of a business and for the country, as well as his resolution as a person who has inherited a company. Four years have passed since then, and, today, in front of all of you, we have come to be able to announce our companies' agreement under the theme of developing automotive prismatic batteries. I, personally, couldn't help but think that, since our first meeting at the Sakichi Toyoda Memorial House, there would come a day when we would be here together like this. The automotive industry is now facing an era of profound transformation, the likes of which come only once every 100 years. No longer can we expect a future by adhering to our current path. We realize that we are now in an era in which we must create the future, using our wisdom and technology. What is necessary to create the future is the venture-company spirit of wanting to make the world a better place and the spirit of getting better and better, the ever-present understanding that there is always a better way and better technology. Panasonic has accumulated its industry-leading capability to develop automotive batteries over many years, and Toyota has accumulated vehicle electrification technologies through the development of hybrid vehicles. Toyota also loves cars and is determined to never let them become commodities. Furthermore, both companies have a venture-company spirit inherited from great inventors and entrepreneurs, such as Konosuke Matsushita, Sakichi Toyoda and Kiichiro Toyoda, who devoted their lives to the development of Japan. Today, what I want to communicate to everyone is that our agreement is one that is meant to achieve a more prosperous and more enjoyable society of mobility and one that gives form to the desire that both companies―born and raised in Japan―will lead in the era of vehicle electrification. I humbly request everyone's warm support. Thank you. Good afternoon, everyone. I'm Kazuhiro Tsuga of Panasonic. Thank you very much for attending today's press conference in spite of our very short notice. On behalf of Panasonic, I would like to briefly talk about our battery business, as well as our attitude toward this collaborative effort. Our founder, Konosuke Matsushita, led our company to today's growth under the basic business philosophy of "contributing to the progress of society, and the well-being of people all over the world through our business activities." Based on this philosophy, we are working today to offer products and services that bring better living to individual customers, and beyond that a better society. These efforts come together in a broad set of business areas, such as Consumer Electronics, Housing, Automotive, and B2B Solutions, all under the corporate slogan of "A Better Life, A Better World." Today, the surging demand for electrified vehicles is changing the landscape of the automobile industry and, moreover, drastically transforming its entire structure. In fact, many countries are taking aggressive approaches in light of this trend. I'm sure most of you are well aware of this situation. This all means that, as a company raising the banner of "A Better Life, A Better World," we must first make contributions to bringing about "A Better World" as a way to help offer "A Better Life." "A Better Life" and "A Better World" are closely connected today, and the automobile industry is also facing a heightened need in society for advanced solutions. The battery is a key device in promoting the widespread use of electrified vehicles, and thus toward achieving a sustainable society. This is why Panasonic positions the battery business as one of our primary businesses. Given this situation, Panasonic has been taking a variety of initiatives, from R&D to production, by enhancing our collaboration with carmakers. And now, Toyota Motor Corporation gave us the opportunity to discuss a new approach to collaboration. Consequently, we were truly impressed by their high aims, and we decided to take part in this endeavor. We at Panasonic are strongly resolved to meet the expectations of Toyota Motor Corporation and to jointly study the feasibility of this plan in a speedy manner, with the aim of building a very practical business framework. Panasonic is celebrating the 100th anniversary of our founding next year. On the other hand, in the automobile industry today, we are witnessing a huge wave of transformation emerging from the accelerated electrification of vehicles, among other factors. In this situation, we believe that the next 100 years will see much more drastic changes than even those we witnessed over the past 100 years. Consequently, Panasonic can never survive if we simply cling to our current business models. Therefore, always having the mindset of a "challenger," we will strive to create contributions toward the widespread use of electrified vehicles, fully utilizing our assets and strengths nurtured over the past 100 years. So moving forward, we will make the necessary efforts to meet your expectations. Thank you very much for your kind attention.